Stickman Cliff Diving (Free) – No belly flopping, please! Now that winter is just around the corner, I'm enjoying thinking back to my summer holidays, or more specifically: I'm remembering jumping into beautiful crystalline waters on hot, hot days. Sounds romantic—until you picture the diver performing more of a belly flop rather than an elegant swan dive. The game Stickman Cliff Diving (Free) presents you with precisely this challenge: enabling a stick figure to perform various dives and jumps into the water. More details after the jump. First off, we recommend checking out the tutorial in the app's main menu. This will help you understand the game. Before you embark on any dive you will see the distance between the water and the edge of the cliff. You will also be told which type of dive you have to successfully perform in order to score the minimum of points you have to be awarded by the jurors in order to pass. They might ask you to do a header, frontflip or backflip. Before you lean back thinking this sounds easy, bear in mind that you will often be asked to rotate and execute 1 1/2 revolutions at a perfect angle to the water. This calls for coordination and a sensible estimation and gage of heights. The jurors will then mark your dive, and be warned that they are a tough crowd. 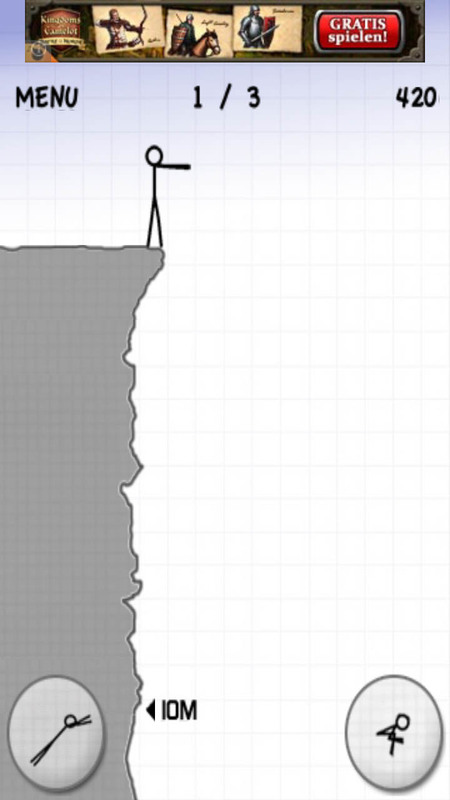 The Stickman Cliff Diving (Free) challenge is to perform as many dives as possible. You get three tries to attempt each jump. Whenever you manage a jump you will receive a certain amount of points as well as a bit of money. You can collect the money, and when you've got enough you can attempt to bribe the jurors so that they grant you a pass even when you've messed up a jump three times. Depending on how mush cash you've got to tempt them with you can either skip a jump entirely or else convince them to allot you more attempts. In this way you can rake in the points, though we advise that you keep track of your own highscores, seeing as there's no integrated ranking list, for which we're knocking off a star in our rating. 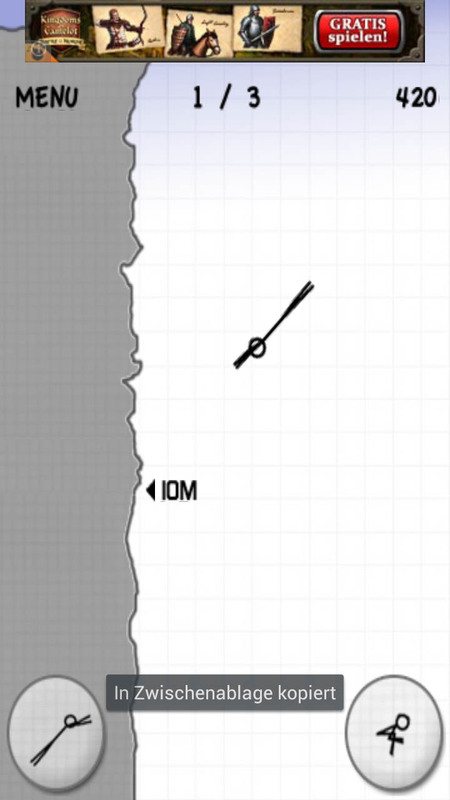 We feel this type of feature is pretty essential for games such as Stickman Cliff Diving (Free). Go to the main menu in order to de/activate the sound effects and/or background music. The quality of the sound isn't exactly grade A: it's rather muddy sounding. Another slight drawback is that the back button terminates the game, rather than navigate back to the last menu. I accidentally hit the back button a few times before this fact became engraved in my brain. That said, if you do wind up making this mistake you can rest assured that your last game will be saved so that you can pick up where you left off. 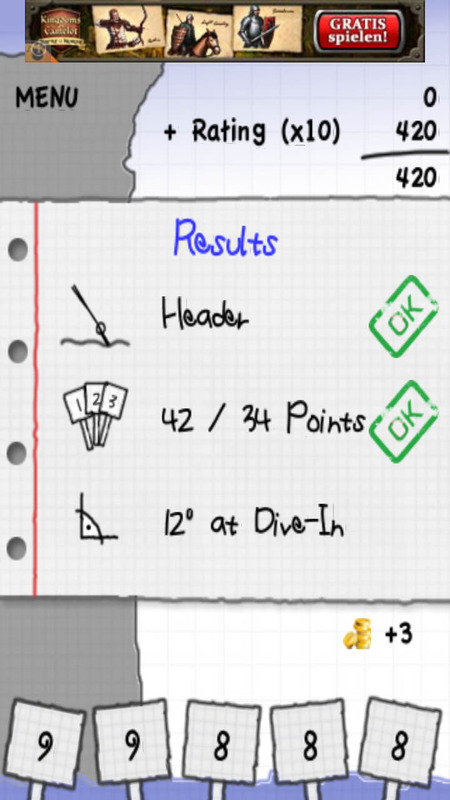 Stickman Cliff Diving (Free) has a funky concept but I wish there were more variants or varied challenges. I would also like to see more options for controlling the stick figure's body so that it might perform more stunts when it's in mid-air. Overall I would say the game isn't bad at all, but suited more for intermittent periods of time rather than long hours of gaming. The Stickman Cliff Diving (Free) graphics are, as the app title suggests, largely based around a stick man figure: simple but nicely done. That said, the graphics aren't in HD, which is a bit of a shame as it means that the game isn't as sharp as it could be on devices such as the Samsung Galaxy Note (2) or Galaxy S3. 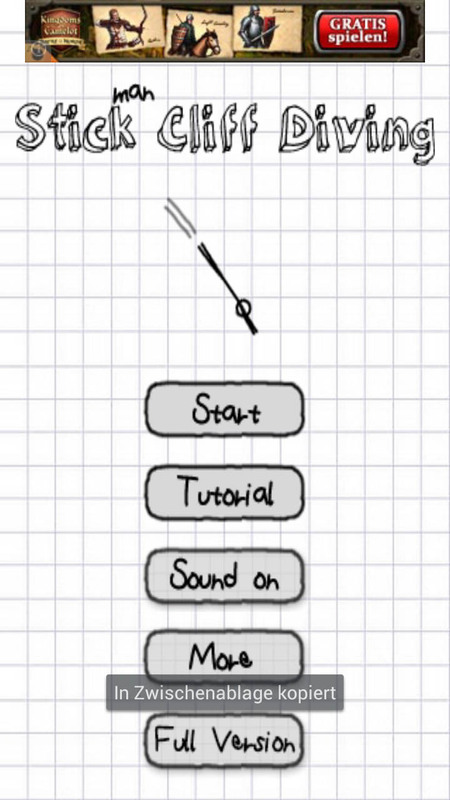 Controls are quite good, although we would like to see more options for navigating the stickman figure. 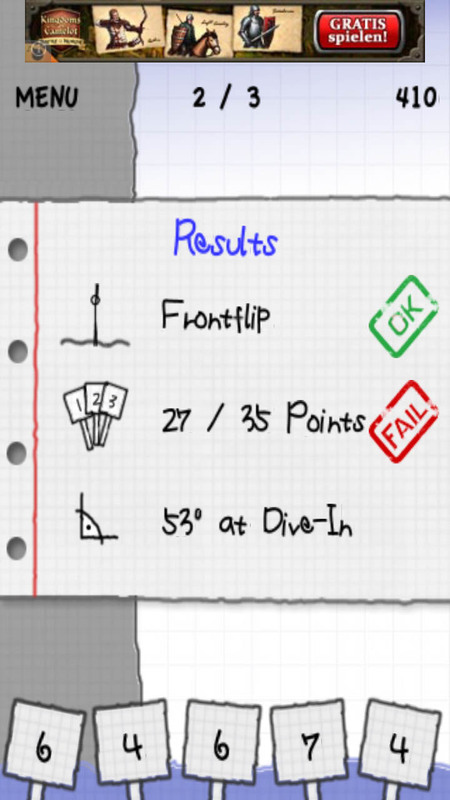 Stickman Cliff Diving (Free) performed nicely throughout our test runs: fast and stabile. Stickman Cliff Diving (Free) is free and financed by ads which are displayed in the form of a discrete banner at the top edge of the display. You can find the game in the Play Store.